As early as 10,000 yrs ago music had been developed by man. Used for religious cermonies and rituals, music was created and used for the sole purpose of magic. It is written that in ancient Babylon the city's court musicians would travel outside the city walls (usually during a solstice or equinox) and play the most frightening and cacophonus music possible with the sole pupose of scaring off demons, who were known to try to infiltrate the city and possess it's citizens. In ancient times musicians were sorcerers of the highest order. From the Gamelans of Bali to the Master Musicians of Jajouka (Morroco) to the Voodoo drummers of Haiti, the musician as Magus is a long standing tradition that is older than civilization itself . Drawing upon this idea of music as a form of magic, that could tap into the primordial uncarved block of primitive consciousness, CAN was formed. "There are some secret CAN rhythms" has been stated by CAN drummer Jaki Leibziet many times when refering to CAN's likeness to Haitian voodoo musicians (in some voodoo sects the rythms used in the drumming are so sacred that the revealing of them is punished by death). An interesting interview with the members of CAN in the April '97 issue of WIRE stated that at one concert Jaki focused on one person in the audience and focused on the rhythm of her dancing. He then seemed to lock up with her rhythmically and procceeded to move her to such a state that she ended up vomiting and finally collapsing. 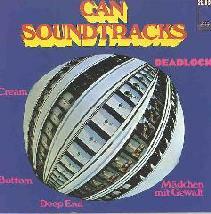 CAN formed in the early sixties and much has been made of their connections to electronic composers like Stockhausen and Ligeti (both bassist Holger Czukay and keyboardist Irmin Schmidt studied under Stockhausen) but, CAN was not working in the classical-rock area of a ELP or YES. Their use of avant garde electronics was just one aspect of the greater whole which included Reggae, Psychedelia, Tribal music, Jazz, Blues, and Rock music. They would spend days brewing together these styles at their studio in Germany called Inner Space. But they were also influenced by other things such as astrology, the I Ching, and quantum physics. "I was very interested in the cosmic harmonies. I spent long nights comparing the revolutions of Mars, trying to figure out what chords they were making" guitarist Mike Karoli stated in the recent interview with WIRE. With these techniques in use CAN could create music with such shimmering celestial beauty that it is enough to make you wonder if they are not influenced more by the rhythmic pulsation of the atom rather than other music. 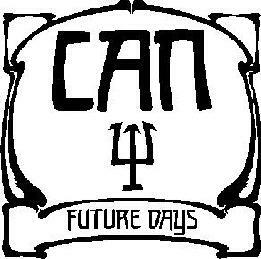 In 1974 CAN released "Future Days" which is considered the artistic zenith of their career. Utilizing field recordings of natural phenomena (birds and radio voices) they created a recording of such depth that upon a first listening, one is lulled into a state of dreamy hypnosis. The recording has a oceanic vibe to it (they used their echo machines to mimic coastal areas along the Atlantic) and is the aural equivalent of Stanilov Lem's SOLARIS. If Pink Floyd's "Interstellar Overdrive" is the voyage, then this album is the destination. This is an album that every music lover should experience, let alone a ambient or Spacerock fan. CAN had many different musicians play with them but the core was always there even up to the end. They had two singers: Malcolm Mooney, a African-American artist who had to leave the group after a year due to psychological problems, and Damo Suzuki, a Japanese man who could barely speak english and very little german. It is with Damo that CAN created their most ritualistic and celestial music. On albums like "Tago Mago" and "Ege Bamyasi" there is such a sense of ritual and concentration that you can not help but to be hypnotized. The music has a rhythmic ambience that seems to pulse in sympathy with the whole of the cosmos. As Holger Czukay stated succinctly back in the 70's "electrons are musical!". Unfortunately this group was too good to last forever. 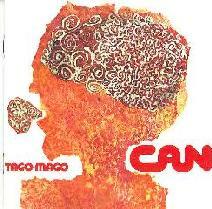 In the late seventies Czukay left shortly after Damo's departure and CAN would only occasionally have the same spark on their subsequent albums. They eventually broke up completely, shortly before the eighties took hold and each member pursued solo careers, some doing film music and others producing. But in the late 80's CAN decided to get back together (with Malcom Mooney back on vocals) and recorded a album called "Rite Time", which was much a "rite" in that it invoked the past, but unfortunately only in fleeting moments. After finishing the album, CAN once again broke up and the legend of the group subsequently grew. As of the writing of this article the core members of CAN are planning on releasing a live video and CD which captures some of their greatest performances. Also, there is talk of another biography coming out (Pascal Bussy's bio on CAN is higly recomended) as well as a collectors set. Of course there are the typical reunion rumors and who knows? Maybe the magic will take hold once again.